Our Dream Foreclosure | Someone else's nightmare. Our dream. Did you miss seeing this week’s baby bump picture? Well… check it out over at our new site… MakingOurDream.com. Make sure to change your RSS feed… we’re breaking out the mothballs for this site. This blog is going away. … of joy! Because we’ve got a brand-spankin’ new blog for you! More on that in a minute, first we want to explain some things. Memories… that was our first post here on Our Dream Foreclosure, way back on August 30, 2009. Since then, we’ve realized what a hot topic foreclosure can be. For us, it’s a great word… it meant we could afford a house we otherwise would not be able to pay for. For others, it’s a trigger word – and it triggers feelings of regret, depression, and sadness. We’ve had awkward conversations in the last three years – where we’ll happily spill our story of how we got our house, only to have the other person then spill their story – of losing a home to foreclosure or being under water and hoping for a short sale. For the record, we hit a perfect storm that summer day in 2009. We qualified for the FHA loan incentive, which meant less money for our downpayment. We found our house at a steal because it was a foreclosure and had been sitting on the market for six months. (Read more about that in our “how we met” post.) We were able to lock down an interest rate on our mortgage that equaled an affordable payment. Now, homes in our neighborhood have appreciated so much, we probably couldn’t buy here. We know we’re blessed. We know we’re in the minority. We are so, so thankful for what we have and do not take it for granted for one second. When Michelle lost her job a few months ago, we talked about downsizing or looking for a home that would equal a lower monthly mortgage payment. However, we quickly realized there was nothing on the market (even smaller or in a different zip code!) that we could afford. The best option, financially, was to stay put – which we are more than happy to do! So, all that to say, for a long time now, we’ve really wanted to drop the “Foreclosure” from our blog title. We don’t want to turn people off because of what that word might trigger for them. We also don’t want to constantly remind people that the downturn in the economy, which was a downer for most people, was a serious bonus for us. …we’ve strayed a bit from being a strictly DIY/Home Improvement blog. That’s our fist love and passion and what we’ll always primarily blog about. However, we also like to talk about Kenton and presumably we’ll feel the same way about his soon-to-arrive little brother or sister. So, we wanted to move on to a new title, a new blog that better reflects what we’re really about. So, we present to you…. Check out our new digs at makingourdream.com. We’re even on Facebook (finally! )… and you can “Like” us (really, really like us!). We hope you pack a bag and follow us to our new Internet home. Starting immediately, we’ll be posting new content over there – and soon, we’ll have everything on this site redirected. Please update your RSS feeds if you follow us on Google Reader, Feedburner or something similar. I think my OB reads this blog. Yikes! More on that in a second. We did it! We made it to full term. Not that I’m shocked. My body seems to like having a baby in it and holds on to them for dear life as long as humanly possible. I know this is a blessing. 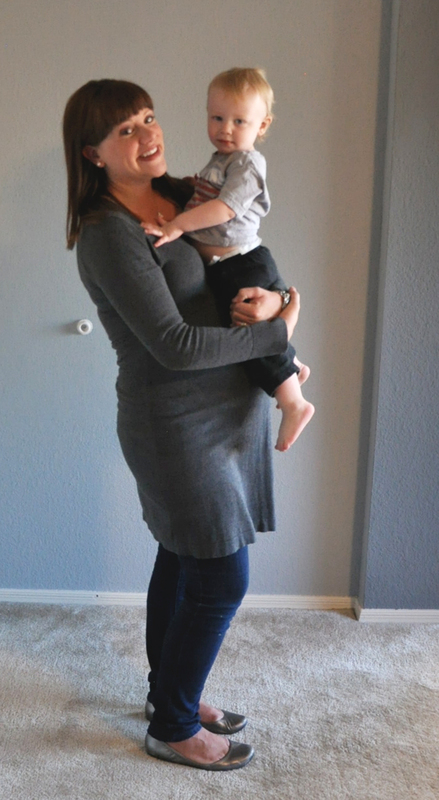 Many mommas worry about making it to week 30 or 35 – so I won’t complain. I will, however, say that I am more anxious than last time that this babe not overstay his/her welcome (like Sir Kenton who cashed out EIGHT DAYS late). The longer we go, the less chance I have of a successful VBAC, which is my goal. So… remember a couple of weeks ago, when I complained about having OB appointments EVERY GOSH DARN WEEK from here on out? Well, I think my OB must have read that. Because she told me to take this week off. FOR REALS. She’s livin’ it up in Cabo (hollah to our honeymoon spot!) and said I could see the Nurse Practitioner if I really wanted to, or I could skip. Um, that was an easy one… I chose “skip.” Which I never would have done last time around! This time, I’m hoping the two weeks off gives me a chance to actually progress a bit. (There was nada progress at my 36 week appointment.) And… I’m now taking any and all tips to get this baby to DROP. So, comment away on that topic, if you have something to share. 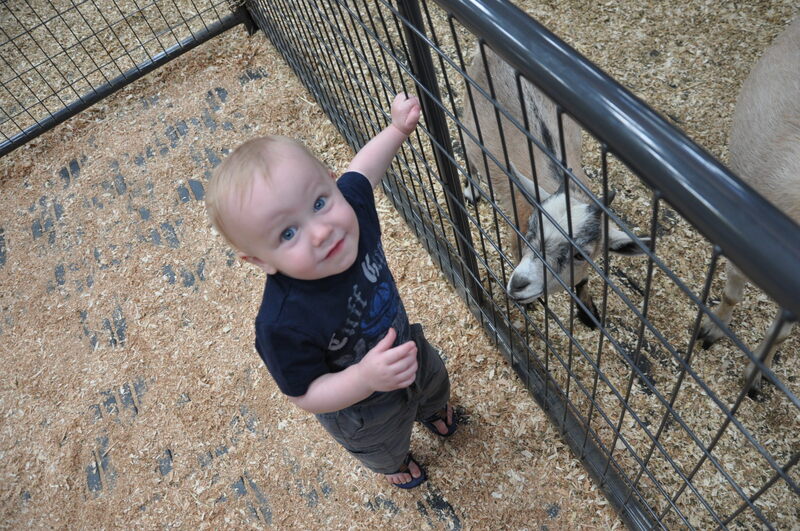 So, will this crazy kid have a little brother or sister? You can still vote in our poll! PS – this is THE LAST BUMP PHOTO POST you will read at this url. New blog launches NEXT WEEK! YIPPEE!!! You are in for a treat today! That is, if seeing my face and hearing my voice is a treat for you. Because… today, I present our first VLOG! Please ignore the mic cord under my shirt that looks like some strange vein popping out. I haven’t mic’d myself while this pregnant before! Thoughts? Please leave a comment! 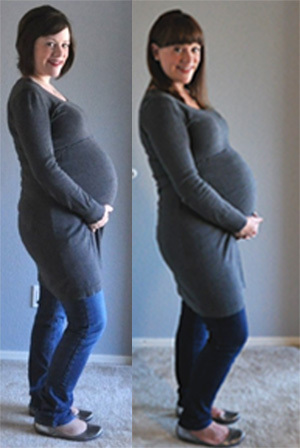 36 weeks of growth in that bump! Is it just me or is there less of a dramatic difference this time around between weeks 26 and 36? Last time, you can see a lot of growth… this time, I feel like it didn’t really change much. Hmm… could be the camera angle. I dunno. 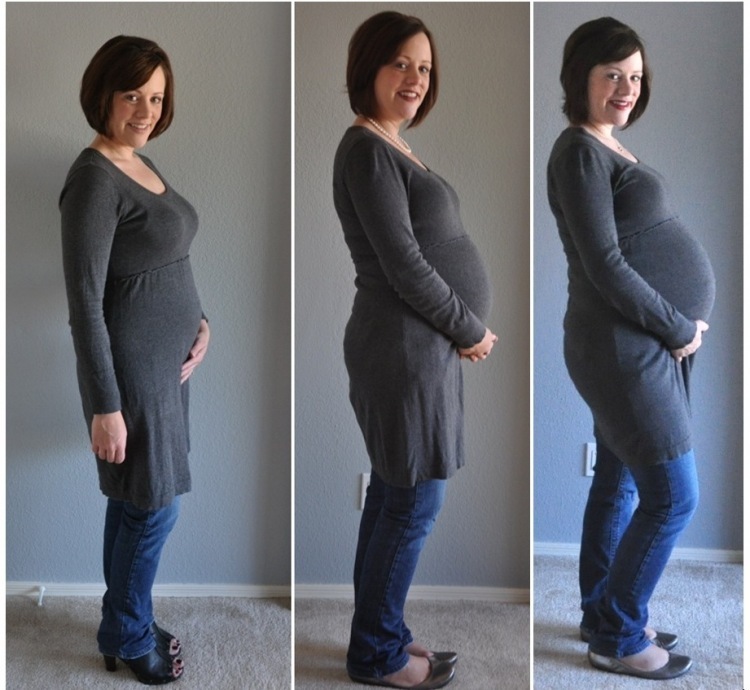 Here’s the 36 week to 36 week comparison… Am I carrying differently? Sorry about the quality of that image. I had to snag the photo on the left off the site because I couldn’t find the original anywhere. Oopsies! Personally, I see only a slight difference. I think the bump slants down more on top and is overall slightly smaller. But… what do you think? Poor guy! 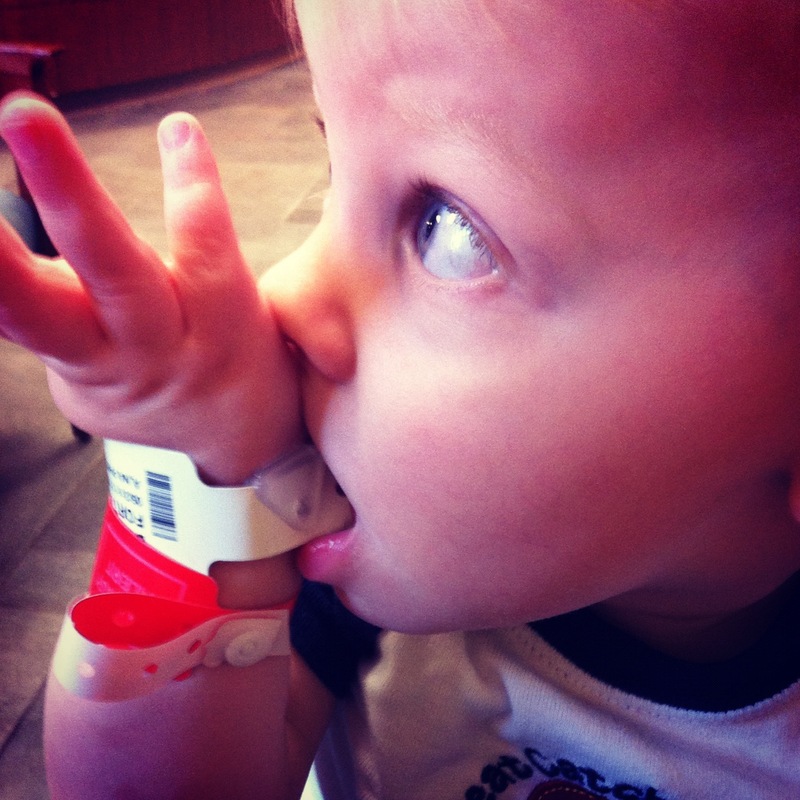 He’s had a stomach bug and was a bit dehydrated, so he needed an IV. It was incredibly traumatic experience for him, me and Jason. UGH! 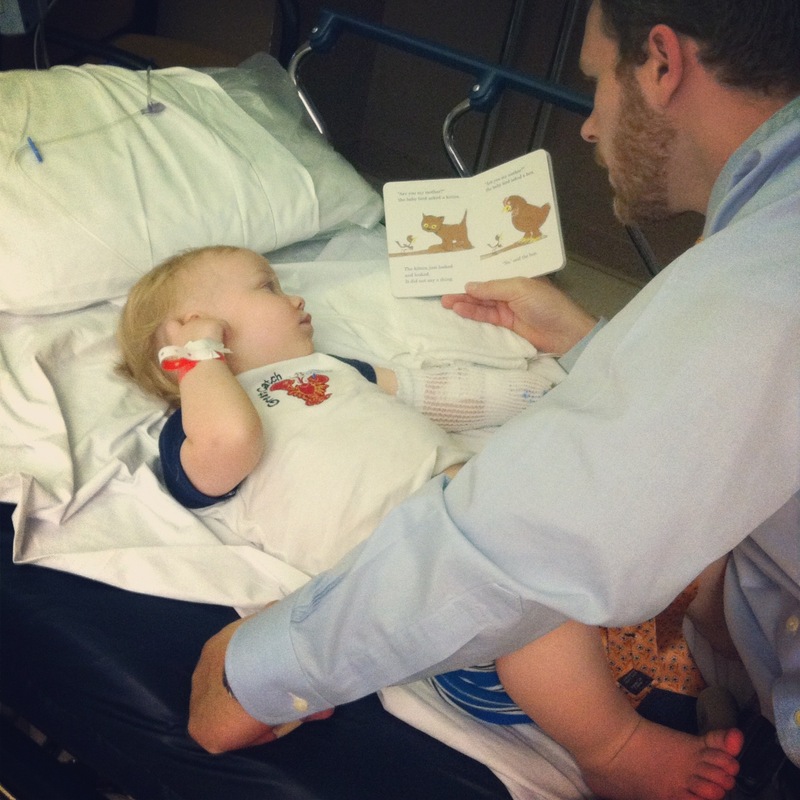 As any parent knows, it is absolutely heartbreaking to see your child hurting and upset. 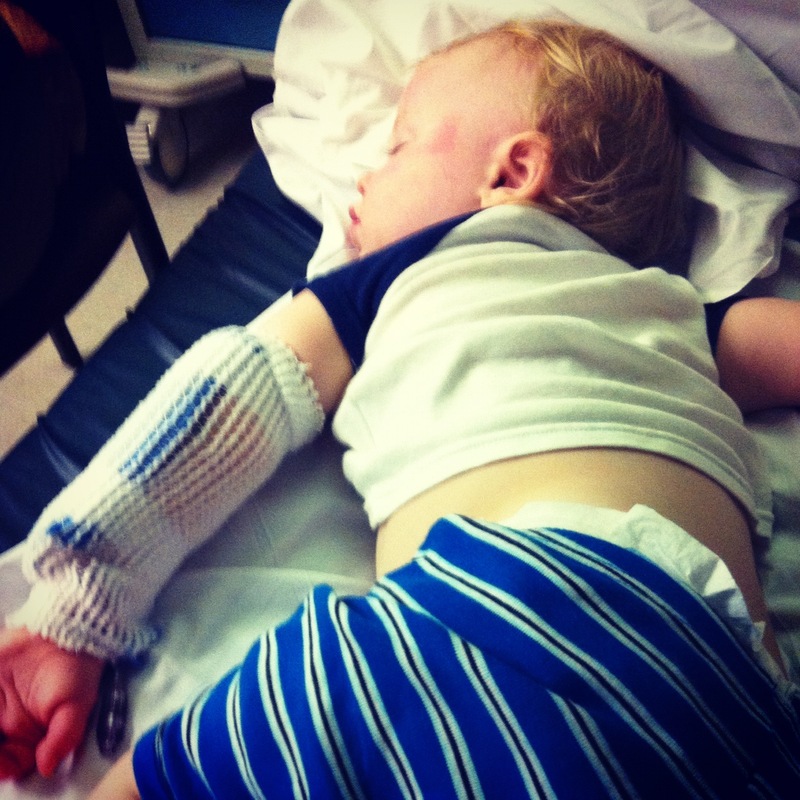 However, I think that intervention did the trick as he does seem a bit better today. Whew! 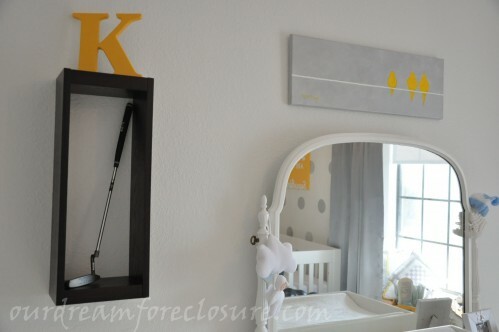 It’s day two of Pregnancy Week here on Our Dream Foreclosure and today’s topic – the baby room plan! 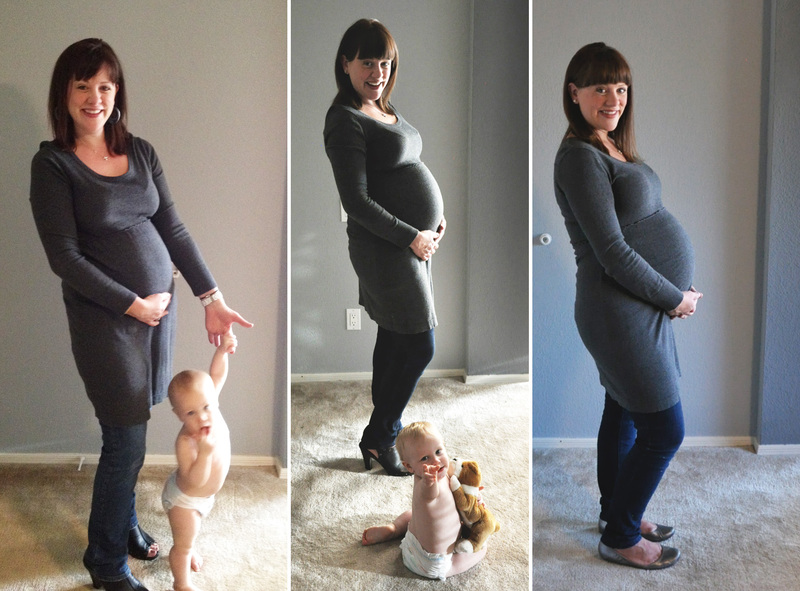 Yesterday, I discussed my birth plan and may have shared a bit too much… heehee. The plan all along was to make that room gender neutral and use it for both of our babies. I can’t believe it’s actually time to move Kenton out and make way for his little brother or sister! 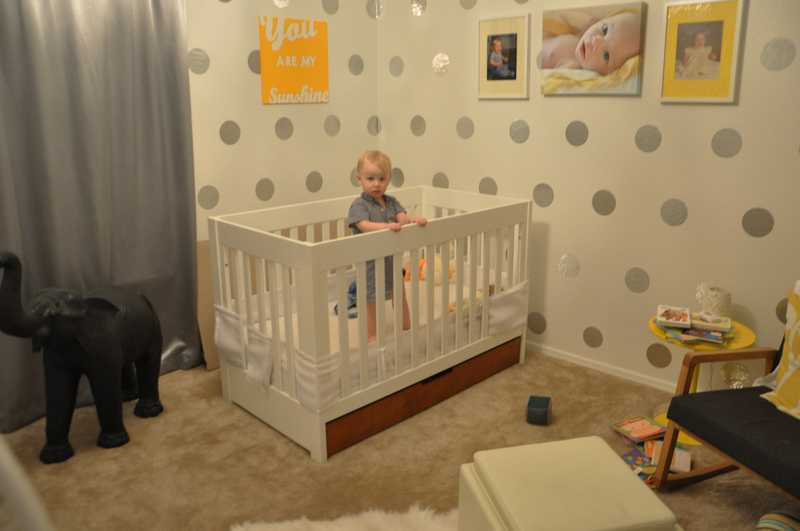 But he’s taking the crib along with him to… his “big boy” room! 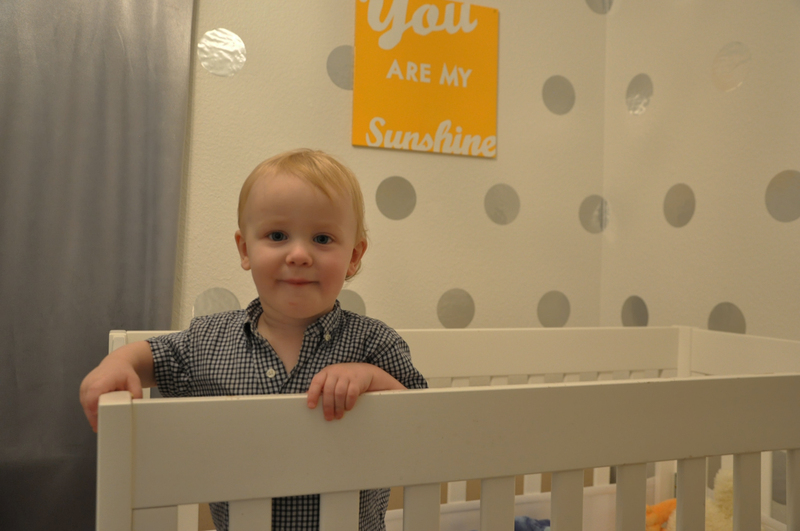 Well, we’re calling it Kenton’s big boy room, but it’s really going to look like another nursery – a boy’s nursery – for a while. More on that in a minute, back to where the new baby will sleep. Note: we later swapped out the rocker/ottoman – pic at the top of this post is accurate. Baby will go in the nursery and the only major change we’re making is a crib swap. 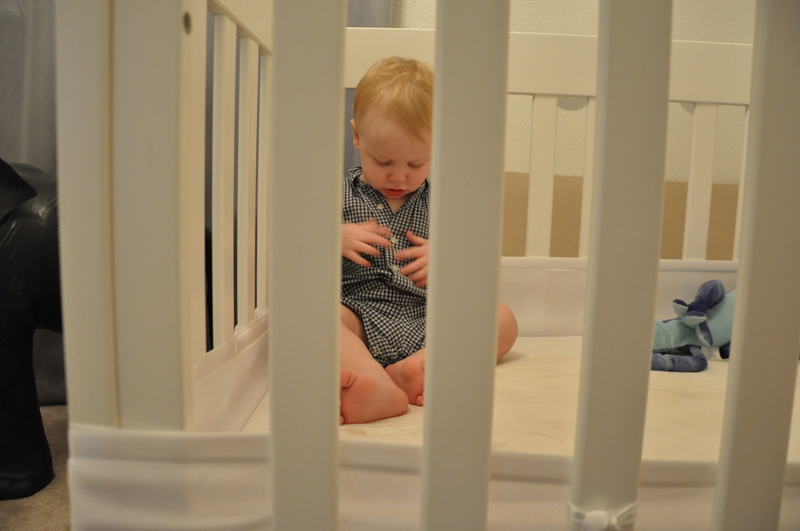 Since Kenton is taking his crib with him, baby needs a new crib – which we’ve already purchased. We decided not to get the same crib we got for Kenton and go for a cheaper, Ikea crib for the baby. Why? Because we care less about our second child. Ha! Obviously, that’s not true. Kenton is very active – jumping in his crib and basically beating the thing up. The baby will be a blob for about three months, then just roll around for another three. Finally, around six months he/she will be sitting up and a couple months after that will start to pull up to stand. Basically, we figure we have at least six months with the “cheap” crib before Kenton may be ready for a toddler bed and the baby gets the sturdier crib in time for shenanigans like standing and jumping. That’s the thought anyway, we’ll cross that bridge when we get there. Right now, it was far less painful to spend $99 than $300 – plus we still had to buy a $169 mattress. Kids are expensive! 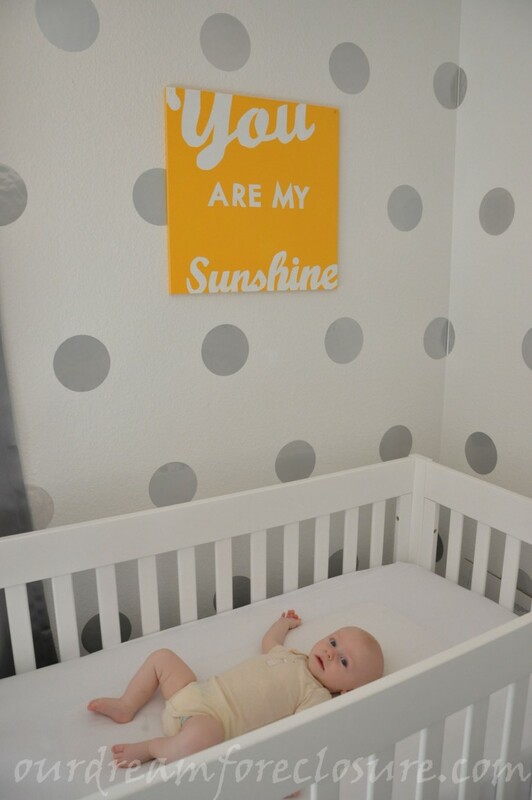 Other than the crib, we’ll only make minor changes – like swapping out the K’s and other items with Kenton’s name. And, of course, we’ll have my mom add a bird to the wire! 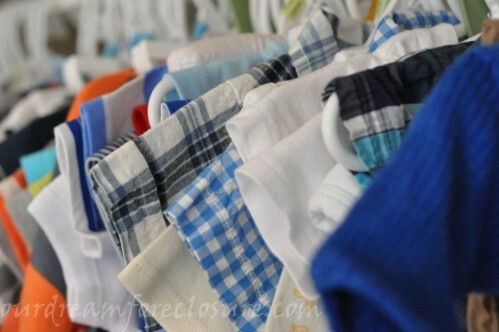 The closet will have to be cleared of 24mos clothing and newborn selections will be put back (I kept them all!). 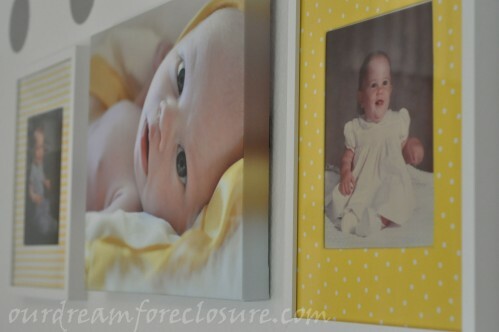 We’ll also add a portrait of the new baby to this wall, once we have a chance to take one. My initial thought is that I’ll move Kenton’s portrait up higher and put the new one below it – but we’ll see how it comes together. But that’s it… otherwise this room is ready to go! The most challenging part of this room shuffle was taking all of my sewing/craft crap that had been in Kenton’s new room and moving it into the study – into a merged space – Half office/half craft room. That part is coming together nicely, actually – but that’s for another post! 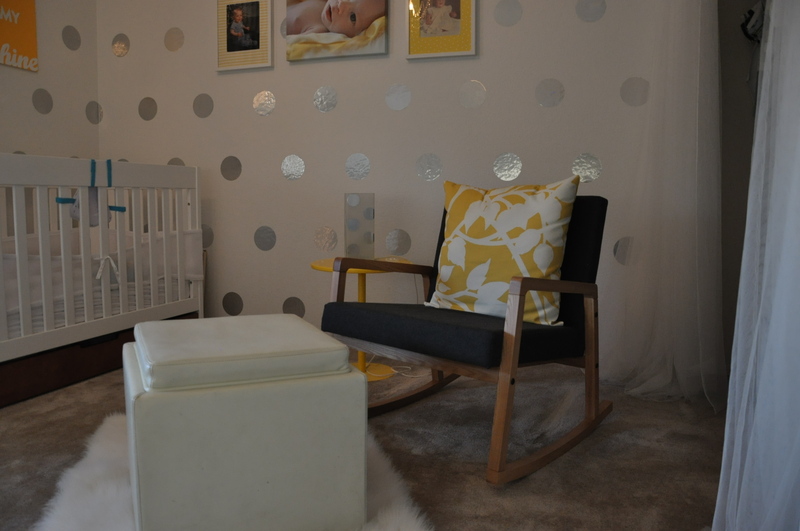 Kenton’s room is coming along… but is not ready to be revealed. 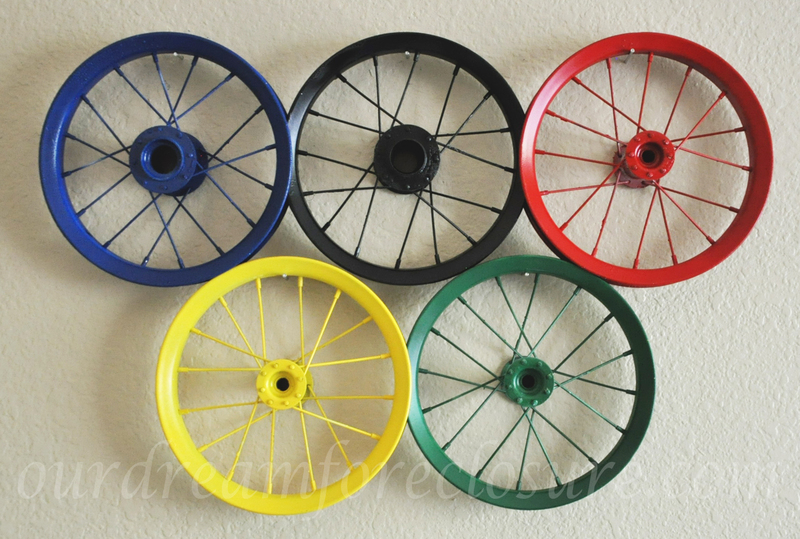 It’s going to be a “Big Boy Bike Room” – with inspiration from Le Tour de France. This photo is my primary inspiration. 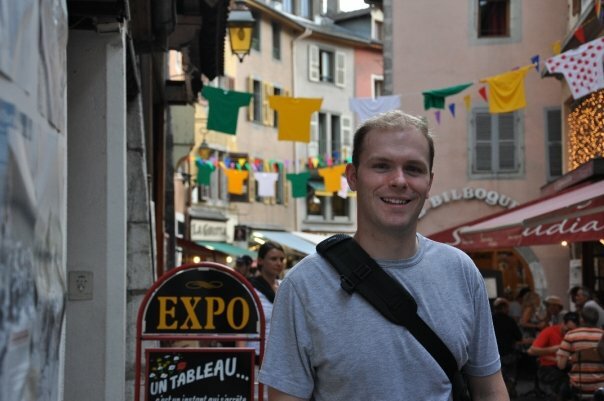 It was taken in Annecy, France while we were there following Le Tour. I love the different Tour jerseys criss-crossing the quintessential European street. I have those colors/patterns and I’ll be making some bunting to mimic this and using those colors as accents in the space. 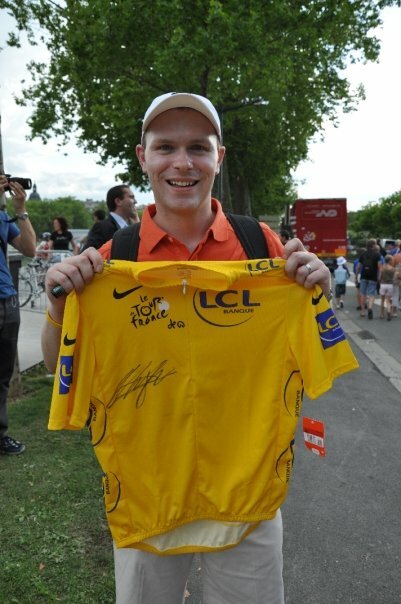 We actually have a yellow jersey signed by the 2009 tour winner, Alberto Contador, that we will display in there. There’s Jason with the jersey just after we scored the autograph. That was such a fun day! We’ll also be putting up bookshelves on one side and using a little Ikea tent as a reading cave. Our goal is to make it look more like the flamme rouge you see with one KM left in a bike race than a circus tent (don’t know cycling lingo? Google it or come back later to see the Ikea hack!). 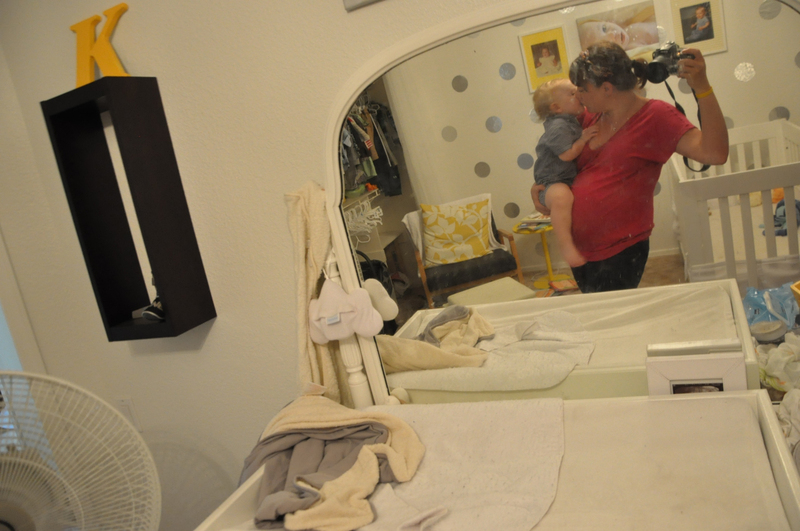 Self-portrait in our daily-used, slightly-messy nursery. Only my “baby” for four more weeks!